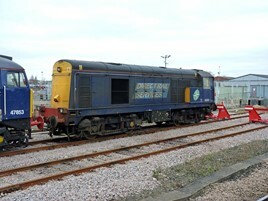 Three Class 20s are up for sale at Direct Rail Services. The locomotives (20304/308/309) are all stored at Barrow Hill, and have been out of service for at a year. Currently DRS has no serviceable ‘20s’, and will be left with five (20301-303/305/312) following the sale of these. The three ‘20s’ for sale are all due an F exam. DRS says 20304 has worn wheelsets and an earth fault on its generator, 20308 has worn wheelsets and requires extensive bodywork corrosion repairs while 20309 is described as having worn wheels but is generally in good condition. The four coaches are all former MK 2 Virgin Trains East Coast barrier vehicles, and are stored at MoD Longtown. The vehicles are 6354/355/358/359. DRS is also selling 12 Mk 3 bogies. The closing date for responses to the Invitation to Tender is February 9.